Around age four, my favorite stuff on TV was Sesame Street, anything Walt Disney-related, and Leonard Bernstein conducting West Side Story. There’s a documentary about that recording, which my parents taped in the early 90s. And I just couldn’t get enough of it. Whether that makes me an ordinary toddler is yours to say. Why indeed would a small, barely articulate kid get addicted to a long, grown-up documentary about recording a cd? Well, maybe here’s an answer: is it possible to see Leonard Bernstein at work and not believe that making music is the greatest thing on earth? Why would you need technical knowledge of music or the recording process to respond to this man, whose every gesture seemed to be as true and real is it gets? Why couldn’t a four-year-old be completely awestruck? To claim a fascination with Bernstein barely counts as original. And it’s hard to disentangle all the different motivations that ultimately bring you from original spark to full-blown musicianship. But Bernstein was there, at the beginning. And I owe him a beer for that. There’s a lot of talk about identity these days. And, true, it’s hard to figure out who you are, who you’d like to be, and whether those two things are compatible one way or another. Anyone pursuing an artistic path knows this particularly well. I met Dinu Lipatti on a train to Paris, over a decade ago. Not physically, obviously – he died almost forty years before I was born. But I listened to some of his recordings. Being no poet, I still find it hard to describe the experience. But again – although in a very different way than Bernstein – here was someone who radiated musical truth. Someone who proved that there is such a thing as objective beauty beyond discussion. More than that, the purity of his style seemed to suggest a man of uncommon moral stature. Someone whose example it was worth following. From some intense years, I collected anything even remotely linked to Lipatti. Recordings (official and pirate), LP’s, biographies, tributes… I flew to Geneva where his manuscripts are kept, approached and interviewed a former student of his – gosh, I even set up a Lipatti Facebook group! I’ve calmed down a bit. Opened up to other kinds of artistic influences. But I owe him greatly: formative years tend to be confusing, and to be able to hold on to an artistic archetype of this quality is a genuine blessing. Lipatti helped me figure out in what direction I wanted to work. My recent recordings featuring his work are my humble way of saying thank you. At about 16 years old, I definitely qualified as a musical omnivore. I would spend hours listening to music, conducting operas in front of the mirror, studying Mahler symphonies – oh and yes: play some piano. In short, I was in love with music, rather gifted, but terribly undisciplined. Enter Jean Fassina. For five unforgettable years, he was the patient, wise mentor that any aspiring musician should have the chance of meeting. He taught me how to listen, listen again, and listen even more. How to balance a keyboard, build a phrase. How to make my back, shoulders, arms, fingers work together in a way that made the piano each time sound a bit more the way it had to. He turned me from a talented kid at the end of his potential into a young adult musician. I still had everything to learn but, at least, I was now decently equipped to do so. Eight hours a day? Barely enough to get it all done. Jean is now in his eighties. I consider him a friend. Of course, it’s necessary to channel your intentions, to understand music as much as you feel it. But in my mid-twenties, I was increasingly getting stuck in an overly intellectual performing style. 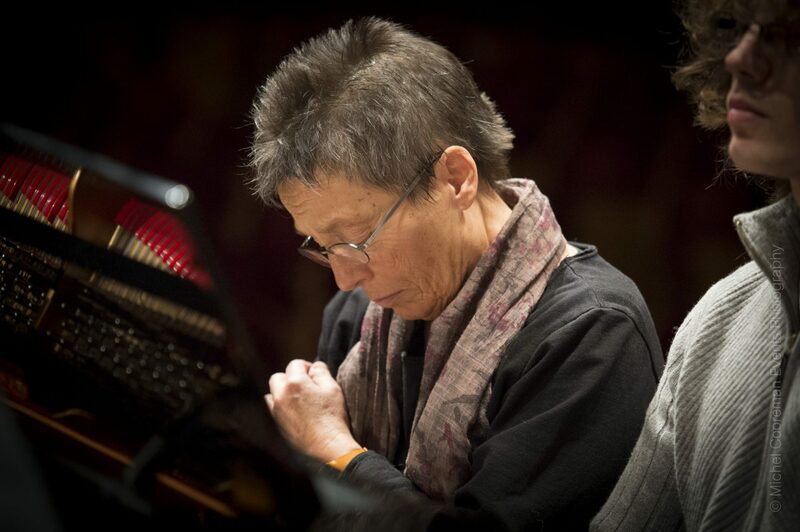 In search for an antidote, I auditioned for Maria João Pires: maybe this extraordinary musician, gifted with the most mysterious instinct I’ve ever seen, could help me? Yes, she could. Maria defies description, let alone analysis. She is sincerely worried about the state of the world in general, the musical world in particular. Together with some other students of her, we tried to help her in the development of the Partitura Project, where she endeavored to articulate her ideas around these issues. She introduced us to the benefits of singing in the development of children. She also took us with her on stage, selflessly introducing us to her artist and promoter friends. I played Schubert’s Fantasie with her innumerable times. Having her next to you playing out that first, heartbreaking phrase is my definition of unforgettable. Those five years were a privilege and an emotional roller coaster whose intensity was, on rare occasions, almost unbearable. Maria teaches by example. Ultimately, I learned from her that your most important asset, on stage and in life, is your freedom.